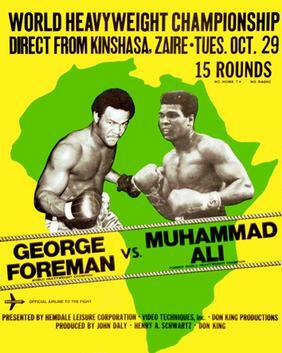 The Rumble in the Jungle was a historic boxing event in Kinshasa, Zaire on October 30, 1974. Held at the 20th of May Stadium, it pitted the undefeated world heavyweight champion George Foreman against challenger Muhammad Ali, a former heavyweight champion; the attendance was 60,000. Ali won by knockout, putting Foreman down just before the end of the eighth round. It has been called “arguably the greatest sporting event of the 20th century”. The event was one of Don King’s first ventures as a professional boxing promoter.